Browse Overland Park, KS homes for sale. Can't find a real estate listing that fits your needs? Try our advanced Kansas City Metropolitan MLS search. You can easily filter properties by location, price, amenities, and more to find exactly what you're looking for. 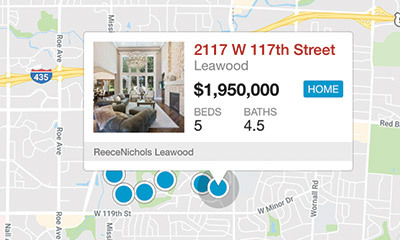 Map SearchExplore Overland Park homes with our interactive MLS map. Market ReportView all active and recently sold Overland Park listings. Listing courtesy of Jake Zillner of Baron Realty. Listing courtesy of Jamie Patton of Platinum Realty LLC. Listing courtesy of Savannah Pritchard of Chief Properties LLC. Listing courtesy of Fran Denton of ReeceNichols CC Plaza. Listing courtesy of Stacy Porto of ReeceNichols Southgate. Listing courtesy of Collette Fultz of ReeceNichols College Blvd. Listing courtesy of Kim Yuille of ReeceNichols Overland Park. Listing courtesy of Brent Sledd of ReeceNichols College Blvd. Listing courtesy of Jeff Yacos of RE/MAX Infinity. Listing courtesy of KBT Leawood Team of ReeceNichols Leawood.